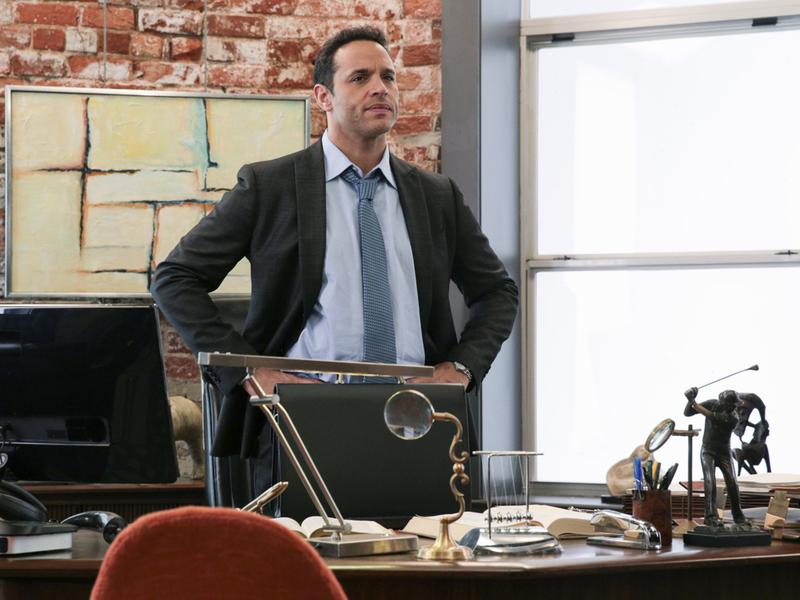 Daniel Sunjata plays a sometimes self-serving lawyer in Notorious, but the actor applauds the work of his costars over his own notoriety. “The cast that we have assembled is just stacked with talent,” Sunjata said during a Wednesday phone interview. The Chicago native obviously hasn’t lost his Midwestern modesty. Hestars as Jake Gregorian, a high-powered defense attorney who colludes with quick-thinking TV news producer Julia George (Piper Perabo). Their relationship helps his clients and pumps up the ratings of her show. Loosely based on the past working relationship between criminal defense attorney Mark Geragos and cable news producer Wendy Walker, “Notorious” airs at 9/8c Thursdays on ABC. The story takes place in Los Angeles, but Sunjata said he would love to someday work in Chicago. Sunjata and I talked about Jake and his flexible ethics, and the “Moonlighting”-style chemistry between Sunjata and Perabo—and how it wouldn’t matter if not for the “strong ensemble” around them. You had seven offers during pilot season. What made this show the one for you? It was just the best pilot script that I read. It was for an amazing network, ABC. They’re kind of visionary in the way they’re conducting themselves, the way they’re advertising, the way they’re casting their shows. And now, of course, we have Channing Dungey as the head of the network. It is making history in that regard. The show was going to be captained by Josh Berman. He’s got kind of a reputation for having some success in the past, so there really was no downside. I love the character as well. It’s kind of a psychology that I have not tried on before. The type of character that I haven’t played before, and I like the premise of the show. I thought it was somewhat subversive while still being commercially viable, and when you can find that as an artist you basically won the lottery. So, there was no downside. What you said about ABC being a visionary; are you talking in terms of broadcasting multicultural shows and having women front and center? Yes, absolutely. And not just in terms of the actors they employ. This is something that I think, top-to-bottom, has kind of just become the norm in all facets of how ABC is supporting [multicultural and women initiatives] and it’s just a great thing to see. It feels good to be a part of it because I am, myself, a mix of all races. … So why not work for ABC. What did you think of Jake when you first read the script? I knew that the premise of the show was loosely based on the relationship between Wendy Walker, who famously produced “Larry King Live” for many years, and Mark Geragos. … If you see them together, you see the dynamic between them, the way that they talk to one another—the banter. The stories they tell—they clearly needed to make something out of it—a movie, a TV show, something. Jake, being loosely based on Mark, I just thought that was kind of fascinating and I liked the way the words came off the page. He seems to be an interesting kind of guy. He’s a high-powered criminal defense attorney who sometimes, I don’t want to say colludes, but certainly washes the other hand. If the other hand is the media he certainly washes that hand and has his hand washed. There’s kind of a mutual beneficialness between the creation of alibis and the creation of headlines. It sounded fun. There’s a lot of clean hands on your show then? Yeah, a lot of clean hands. Do you think is Jake out for fame, glory, money or does he truly believe in the law and believe in his clients? I think a little bit of all of the above. Who’s perfect and who isn’t? What human being on some level is not kind of conflicted and self-contradictory? I think he enjoys being in the spotlight. I think he enjoys the notoriety. He obviously wants to become notorious. [Laughs.] I think he’s a principled man, though. He has a soft spot for children. He has a soft spot for those who cannot defend themselves and who are helpless and oppressed or abused because of that. He’s an adoptee and so, therefore, he’s kind of a sensitive guy. He’s got some traits and some qualities that might not be so savory, depending on who’s judging. At the same time he’s a very successful, intelligent man. He’s a thoughtful person. … I think more than necessarily believing in the innocence of his clients, he believes that everybody deserves a proper defense and that whoever is prosecuting someone, whether they be guilty or innocent, the prosecution has to prove their case. If that’s not done for the worst of the worst in our society, then the rights of all of us are in question. That is true. By manipulating the press he’s just trying to shape the story the way that it will work best for his client, right? Yes, and if he did not do that, the press will certainly still mold and shape public opinion and maybe to the detriment of the clients that he represents. It’s a game that he must play, especially considering the high-profile people that he represents. Members of the media might not care for the collusion between the press and a lawyer. What do you think? Look, not everybody who works for the media is bending the ethics of journalism in order to get their job done, but some do. Sometimes whole governments do it; that’s called propaganda. No, I don’t particularly care about somebody having a bad reaction to it. If it touches home, if it hits a nerve, maybe you should think about that, you people out there. In the pilot when he drives up, in a very nice car by the way, he knows details about the valet’s life. Does he make it a point to know those kind of details about people as a way to always get what he needs from them, or does he genuinely care? It’s probably, again, a little bit of both. I’m sure he is aware that giving that type of attention to people who don’t expect it from him, considering his level of success, can be used as currency. Even if it’s just in terms of the way people perceive him. I’m sure that Jake does care about the way that people perceive him, even if it’s only because he has a reputation and a name to uphold. The firm was started by his father. He and Bradley’s father—Bradley is played wonderfully by J. August Richards, by the way. He’s an amazing actor. At the same time I think it is never lost on Jake that the fact he has only landed where he has—very well healed and well-dressed, by the way—because of grace. Someone decided to love him … who had absolutely no responsibility whatsoever to do so. I think Jake does know deep down that he’s not better, at the end of the day, than anybody else. He knows there are plenty of people out there who, given the same opportunities and the same level of privilege, could excel just as he has. I’m not sure he’s necessarily an activist because of that, in that regard, but I do think Jake does take the time, especially if it’s somebody he sees regularly. … If he can pay it forward, in some sense, he will do it. As we’ll see in the first few episodes, he even works some pro bono cases because he believes in the cases and wants to help someone. I don’t think he’s disingenuous all the time, but I’m sure sometimes he just acts that way because it makes him look good. You remarked on the chemistry between Mark and Wendy, so let’s talk about the chemistry between you and Piper. How important is it and would the show fail without it? I want to start on the circumference and work toward the center. We have to talk about Sepideh Moafi. We have to talk about Ryan Guzman. We have to talk about Aimee Teegarden. We have to talk about Kevin Zegers. … ABC would be remiss to have all these series regulars and to only throw the big pieces of chicken toward myself and toward Piper. Having said that, it’s key that Piper and I do have a tangible chemistry. She and I have been joking since we shot the pilot—we kind of feel like there’s a “Moonlighting” kind of vibe, you know what I mean? We’re trying to have that Cybill Shepherd-Bruce Willis thing between the two of us. At least that’s what we would like to recreate, because we were both huge fans of that show. So yes, the show would actually fail miserably without the component of chemistry between Piper and I as people, as actors, and then also as characters. It would fail equally miserably if we did not have a strong ensemble making us look good, doing great work in their own regard and having their own moments to shine. Are you able to talk to Mark if you have any questions? He is a very busy man. I thought I was busy, bro. Mark Geragos, he must not sleep. The guy just must not sleep. He’s got tons of incredibly well-known, high profile clients, and as a consequence, although he is executive producer on the show along with Wendy and others, he is not as available as Wendy is. Wendy’s able to be on set pretty much all the time. She’s also a great source of research and answers lots of questions for myself and for Piper. But no, I haven’t gotten to spend as much time with Mark as I would like. I’m going to ask him to golf sometime soon so I can smack divots in his direction while I ask him about the finer points of habeas corpus and mea culpa. Are you playing to take the suit you wear home? I’m not going to take anything home, but I certainly won’t refuse them if ABC offered, if my boss offered. They are tailored specifically for me. I will have worn them for the entire season, so I mean, “Hey guys, help a formerly starving artist out.” Yeah, I would love to wear those suits. They are beautiful. I loved your line, “I am so possible,” in the premiere. Do you get to contribute to that banter? That was the first thing Piper and I shot together. We were trying to find a level of playfulness and loose improvisation. When you’re on one of the Big 4 [networks] there’s a structural constraint that’s kind of built into the program. You’ve got to say what they write. But when they let us, we’ll freestyle a little bit and that was a moment like that. You’ll see that Piper has plenty of those, too, as the season progresses. What surprises are coming up? Care to tease anything? There are. And I wish that I could enumerate them without being sued by my bosses.